As a proud official sponsor of the Skagit Valley Tulip Festival, we can't wait to take you to the region's best spring attraction! Throughout April, the Skagit Valley's fields burst with a riot of color during the annual Tulip Festival. While best known for the Tulip Festival, the Skagit Valley is also home to incredibly fresh ingredients and amazing food. You’ll get “skip-the-line” access to both main tulip festival areas, enjoy a stop for lunch in the gorgeous seaside town of La Conner, and round out the afternoon with local wine tasting, hand-crafted cheeses and locally baked bread before returning to Seattle. Door-to-door service is provided from any hotels in and around downtown Seattle. A second pick-up is also available from the Ash Way Park & Ride, a convenience spot for people staying north of Seattle. Not staying near downtown Seattle or near Lynwood? Contact us to ask about joining this tour! Our guests get to “skip-the-line” at both Roozengaarde and Tulip Town, the two main tulip viewing areas. Even on busy weekends with long lines, our guests rarely wait more than a minute or two to get in. Wine & Food Tasting Too! 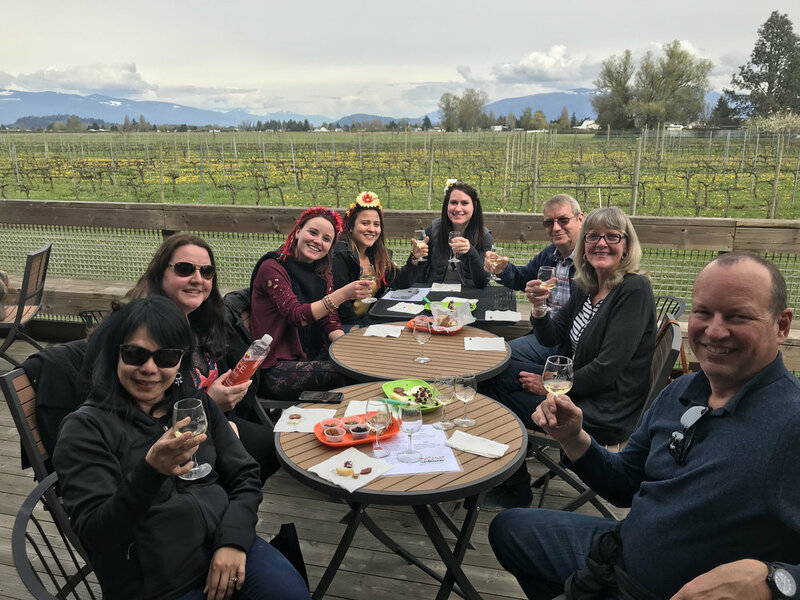 After we’re done viewing the tulips, we’ll stop by a local winery where adults will enjoy a complimentary wine tasting flight along with an artisanal cheese platter, organic bread, and other delicious finger food, all made locally in the Skagit Valley. We don’t want to bring a crowd with us! Our groups are small, this makes for a better experience for you and for the rest of the guests on tour. Your guide will show you the best spots for photos, share some history of the Skagit Valley throughout the day, and recommend local restaurants and cafes where you can enjoy lunch. With curb-to-curb service, you’ll never have to worry about finding parking. Besides, our last stop is at a winery, so you’ll be glad to have a designated driver at the helm! We’ll stop in the charming seaside town of La Conner for lunch. La Conner is widely recognized as one of the most scenic seaside towns in Washington State. Pressed up against a lively waterway, La Conner is also rich with history. Many of the town’s buildings date to the late 19th century and there are many options for lunch as well as local gifts. You’ll be transported in our comfortable high-roof, extended length Ford Transit passenger van. We’ve got plenty of room not only for your head and knees, but also ample storage in the rear compartment. If you’d like to bring along a day bag, an extra pair of sneakers for the ride home or anything like that, we’ve got room for that and more. While we’re not the only tour operator to offer a “tulip tour,” we are the only tour company to offer such a full day and provide an all inclusive experience. The Skagit Valley has so much to offer. We love sharing some of the area’s local food and wine businesses with our guests to give a more well rounded impression of this fascinating region. We look forward to sharing it with you! Recommended to me by my friend, this is for sure one of the best experiences to try out if in town if you are here at this time of the year. 1. They pick and drop you from the hotel of your choice, no need to check for Uber or local transit to arrive at pick-up points. 2. The complimentary wine and cheese tasting is great as it's laid out in an open patio and well arranged during the tour. 3. The guide is extremely courteous, super helpful and has a vast amount of knowledge of the locality, flora and fauna! He gave me clear instructions for the pick-up and was at my hotel bang on time! His knowledge about the details and oratory skills were quite engrossing. During the tour he gave us options to choose between Tulip town and Deception Pass with logical reasons. As a group we decided to go ahead with Deception Pass and it was the better choice for sure. He showed us both the sides of the bridge along with some wildlife and good spots for photography. :) Also, he old us a lot about the geographies and the local food preparation of the area. Thank you Michael for making this tour wonderful! Cheers! “I travelled to Seattle,Washington for the first time this week from Baltimore, Maryland, and on my first night was told about the annual Tulip Festival in Skagit Valley. I was so fortunate to find an all day tour with Nature Nuts Adventure Travel. Mike picked me up at 7:30 this morning and I tell you that this was the most beautiful and fun day I have had in a long time! He was very knowledgeable about the history of this area and taught me a lot on the drive up. I could not have imagined how beautiful this area was and enjoyed taking tons and tons of pictures. Mike even took the time to stop briefly for us to photograph the daffodil fields in bloom. Experience the Skagit Valley Tulip Festival with a premium small group tour. With us, you'll get "skip-the-line" access to two of the top tulip viewing areas, Roozengaarde and Tulip Town. We'll visit the gorgeous seaside town of La Conner for lunch, and round out our day with wine tasting at a charming local winery with complimentary hand-made cheese pairings and freshly baked organic bread. There's no better way to enjoy the Tulip Festival! Your tour will begin when your guide and driver picks you up at your Seattle hotel in our comfortable high-roof, extended length van. As we drive north, you'll get your first glimpses of the snow capped North Cascade mountains and Mt. Baker on clear days. After about an hour on the highway, we'll make our way along the Skagit Valley's back roads and get our first glimpses of fields of daffodils and tulips stretching before us. Your first stop of the day will be at Roozengaarde, the largest tulip producer in North America. Roozengaarde can get very busy during peak tulip season, but you'll skip directly to the front of the line. Roozengaarde's tulip display garden is on 5 acres and is planted with approximately 250,000 tulips each year. We will spend approximately 2 hours at Roozengaarde before proceeding on to the historic seaside village of La Conner. You will have about 90 minutes to explore beautiful seaside La Conner, have lunch at one of the village's many restaurants, and enjoy a cup of coffee or tea at one of the many bakeries and shops lining the waterfront. After lunch, we'll be energized and ready for more tulip viewing. This time, we'll stop into Tulip Town, the second tulip viewing area in the Skagit Valley. At Tulip Town, you will also skip-the-line and head directly into the tulip viewing area. In addition to the expansive tulip viewing areas, Tulip Town also has a delightful gift shop featuring local artists' work and locally crafted keepsakes. You will have approximately 1.5 hours to view and enjoy the Tulip Town display area. Last, we'll stop at a local winery where we'll treat you to a complimentary wine tasting flight, local cheeses and organic bread. On sunny days, we'll sit outside looking across the fields toward the mountains in the distance, enjoying wine and snacks. Your guide (and designated driver!) will take the group back to Seattle and drop you off directly at your downtown hotel. Depending on traffic, we'll get back to Seattle at about 5:00pm. You're just a couple of clicks away from joining the Skagit Valley Tulip Festival, Wine & Food Tour. You don't need to be 21 to join this tour and children accompanied by adults are more than welcome! If you are over 21 and would like to enjoy the complimentary wine tasting, please be sure to bring a state or federal ID with you. We generally pick-up from all hotels in and around downtown Seattle beginning at about 7:30am. If you're not staying within this area, please meet us at the Sheraton Seattle (1400 6th Ave.) at 7:30am. As we usually have multiple pick-ups each morning, your individual pick-up time may slightly vary, either before or after 7:30am. A secondary pick-up location is available at the Ash Way Park & Ride in Lynwood, WA. Pick up from this location will be at approximately 8:15am, depending on traffic. You may select your preferred pick-up location at checkout when you reserve this tour. We will depart the Skagit Valley area by approximately 4:00pm. Depending on traffic, we typically begin dropping guests off at downtown Seattle locations by approximately 5:00pm. For any guests who were picked up at the Ash Way Park & Ride, your drop-off time will be at approximately 4:00pm, depending on traffic. Your individual drop-off time may be slightly before or after that time depending on how many stops we need to make. Drop-offs are made in the order that makes the most sense from a traffic perspective. Tulips + Deception Pass in 1 day! Would your group like to take an incredible seaside hike in Deception Pass State Park after visiting the Skagit Valley Tulip Festival? Yes, we’ve got this tour too! This tour is open for groups up to 14 in size with door-to-door service from anywhere in Seattle. Your group will ski-the-line at the tulip festival, stop in the gorgeous seaside village of La Conner for lunch, and take a 2-3 hour guided hike through Deception Pass. You’ll have opportunities to spot bald eagles, harbor seals and other wildlife, plus fields of sprawling tulips, this is an unforgettable journey.